We’d love your help. 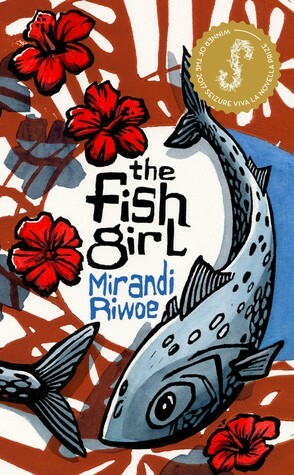 Let us know what’s wrong with this preview of The Fish Girl by Mirandi Riwoe. To ask other readers questions about The Fish Girl, please sign up. This is my first read from the shortlist of the 2018 Stella prize for Australian woman writers. The Fish Girl is a beautiful little novella inspired by a short-story by Somerset Maugham called The Four Dutchman. I don't think it is necessary to have read that story before approaching The Fish Girl, small quotes from it head up each section, but I do think reading it at some point would make an interesting study. The writing here is straightforward but beautifully sensory, placing you immediately This is my first read from the shortlist of the 2018 Stella prize for Australian woman writers. The writing here is straightforward but beautifully sensory, placing you immediately in the lush bright world of Java. The descriptions of food, and clothing, the routines of village life are outstanding. It was a worthwhile experience to read this in a single sitting, to allow yourself to be transported trance like to the world of the Dutch East Indies and spend time with the Fish Girl. This is a review of the perfect gem of a novella that is The Fish Girl (Xoum Seizure 2017) by Mirandi Stanton (Riwoe), winner of the 2017 Seizure Viva la Novella Prize, but before I explore that I have two relevant comments. The first is to commend the high quality of Australian writing – especially by women – that I have been fortunate to read and review recently. We are breeding some seriously talented writers and I am so enjoying the breadth and depth of their work. Secondly, and this relates This is a review of the perfect gem of a novella that is The Fish Girl (Xoum Seizure 2017) by Mirandi Stanton (Riwoe), winner of the 2017 Seizure Viva la Novella Prize, but before I explore that I have two relevant comments. The first is to commend the high quality of Australian writing – especially by women – that I have been fortunate to read and review recently. We are breeding some seriously talented writers and I am so enjoying the breadth and depth of their work. Secondly, and this relates particularly to novellas, I reviewed two of the previous winners of the Seizure Viva la Novella Prize (Christy Collins and Julie Proudfoot) and couldn’t speak highly enough of their work. And now, here we have another. I’m happy to say the high bar has been surpassed yet again. The Fish Girl is in the same league as Nick Earls' Wisdom Tree series. Mirandi’s voice is clear and assured as she envelopes us in a sensory experience inspired by Somerset Maugham’s story ‘The Four Dutchmen’. Mina is an Indonesian girl living a simple life in a fishing village when she is chosen to accompany a Dutch merchant and work in his household. Her life is irrevocably changed by the people she meets and the choices she makes, and by the decisions made by those more powerful around her. This tale is a parable and a fairy story grounded in the rich and luscious detail of the tropics. The language is deceptively simple and the dialogue natural. Native words, customs and objects are deftly incorporated into the narrative with such ease and grace that we feel magically transported to the setting. The themes – of love and yearning, of betrayal and sacrifice, of shame and longing – are universal, yet poignantly specific to this girl, this landscape, this one young woman’s story. Each character is perfectly drawn. The sounds of the market, the smells and tastes of the food, the temper of the weather and the sea, all are engaging and curious. A gorgeous novella that makes high art of Maugham's scraps, The Fish Girl will draw you in gently before plunging a thousand daggers into your soul. Extraordinary. Short and powerful, this is a beautifully written novella that packs a lot into its 100 pages. I wondered if I was missing something by having no familiarity with the Maugham book that this launches off, but the story is strong enough even without that connection. I loved this book so much. The style flowed beautifully, the main character's emotions, dreams, fears and struggles so vivid. It was interesting to read it though the lens of a retelling of the life of one of the characters in W. Somerset Maugham’s story, ‘The Four Dutchmen’. I haven't read the original, but having read some of his other work I could imagine where the focus of his story would lie, and how different this story - sparked by the description of a 'Malay trollop'- would be. Very keen I loved this book so much. The style flowed beautifully, the main character's emotions, dreams, fears and struggles so vivid. It was interesting to read it though the lens of a retelling of the life of one of the characters in W. Somerset Maugham’s story, ‘The Four Dutchmen’. I haven't read the original, but having read some of his other work I could imagine where the focus of his story would lie, and how different this story - sparked by the description of a 'Malay trollop'- would be. A jam-packed novella that hits hard. The writing was beautiful and sensuous despite the brevity of the story overall. It manages to build suspense, have twists and turns, love and fear and hate, all in under 100 pages. In fewer than one hundred pages of storytelling, Ms Riwoe creates a character who is now haunting me. Mina is an Indonesian girl living with her parents in a small fishing village. She is chosen by a Dutch merchant to work in his household. Mina did not want to leave home, but the decision is her father’s and she has no choice. Once she arrives, she works in the kitchen with Ibu Tana. One of the things that makes Mina’s new life more bearable is Ajat, the boy from her village who also works there. Mina longs to return to her village, to what is familiar. Ms Riwoe brings Mina’s world to life, with her descriptions of food, of people, of the bustle of markets, and of the tropical weather. But while Mina may have the limited freedom to make some choices, her life is no longer her own. And choices often have unforeseen consequences. I find myself wondering whether (and how) Mina’s life could have been different once she left the fishing village. I enjoyed this novella, in the way that it was affecting and packed a punch for such a slim volume. But it also made my blood boil to read about the treatment of a young and innocent Indonesian woman at the hands of men and colonialists. Based on the blurb on the back, this was inspired by W. Somerset Maugham’s ‘The Four Dutchmen’, and now I kind of want to read it, but also not sure I really want to - and yet certainly admiring of Mirandi Riwoe’s efforts here. No wonder it’s won a prize (the 20 I enjoyed this novella, in the way that it was affecting and packed a punch for such a slim volume. But it also made my blood boil to read about the treatment of a young and innocent Indonesian woman at the hands of men and colonialists. Based on the blurb on the back, this was inspired by W. Somerset Maugham’s ‘The Four Dutchmen’, and now I kind of want to read it, but also not sure I really want to - and yet certainly admiring of Mirandi Riwoe’s efforts here. No wonder it’s won a prize (the 2017 Seizure Viva La Novella prize). A short, yet accomplished and ‘complete’ work that managed to pack in suspense and hints of deeper themes, while making light work of the playing of my emotions while she’s at it. All the stars. A beautiful sensual tale, with an acute sense of place. You can effortlessly smell and taste Mina's world, while also sensing the wider world that shapes her life. The seeming simplicity of the story, spiced with charm and dread, lends it the moral weight of a fable. Very memorable, and highly recommended. 2nd read for Stella Prize 2018. This was incredible. Um, wow. I felt completely immersed in this story even though it's only a novella. It as just absolutely beautiful. I really hope this one makes it onto the longlist! A most beautiful novella. This was winner of The Seizure Viva La Novella Prize in 2017.Inspired by one of my favourite authors W Somerset Maugham and his story ‘ The Four Dutchman’. Winner of the 2017 Seizure Viva La Novella Prize and shortlisted for the 2018 Stella Prize, Mirandi Riwoe’s The Fish Girl is a lush, fable-like novella set in Indonesia. It tells the coming of age story of Mina, a young village girl whose life is changed forever when her fisherman father sends her away to become a servant for a Dutch merchant. Sent to work in the kitchen under the bold and fierce tutelage of head cook Ibu Tana — a woman so large she has to come down the staircase sideways — Mina Winner of the 2017 Seizure Viva La Novella Prize and shortlisted for the 2018 Stella Prize, Mirandi Riwoe’s The Fish Girl is a lush, fable-like novella set in Indonesia. It tells the coming of age story of Mina, a young village girl whose life is changed forever when her fisherman father sends her away to become a servant for a Dutch merchant. Sent to work in the kitchen under the bold and fierce tutelage of head cook Ibu Tana — a woman so large she has to come down the staircase sideways — Mina finds herself learning new dishes and discovering new tastes: her sense of wonder is palpable. Slim and pretty, she is soon promoted to serving the food to the Master and his regular guests, one of whom — a fat, jolly sea captain — takes a shine to her. Before long she is asked to give him Malay language lessons and he bestows her with lavish gifts, including a wooden box filled with frangipani flowers and a delicate gold anklet. But Mina, who is young and naive, is unaware that this attention might come at a price: she is more interested in Ajat, the beautiful boy who drives the horse and cart when she is sent to buy goods from the Chinese produce store. The Fish Girl was short listed for the 2018 Stella Prize, and deservedly so. The post-colonial novel takes the marginalised voice of the Malay girl in W. Somerset Maugham’s story, ‘The Four Dutchman’, and writes the story from her perspective. This is my favourite type of writing, which critiques notions of the literary canon, and is reminiscent of Jean Rhys’ novel, Wide Sargasso Sea. A beautiful, poignantly told novella. This book is my favourite reads of the year so far. I picked it up to flick through and didn’t get up until I finished it. So beautifully written. The story has stayed with me and, even though I read it a while ago, I still think about it often. Quite haunting. I devoured this novella in one short sitting. What an incredibly sensory experience. There are so many powerhouse female writers in Australia. Beautiful written this novella leaves you with a punch to the chest. I adored getting to see the Malya culture, I could feel the heat of the sun and hear the lap of the waves. The move from her sheltered, gentle l The Fish Girl by Mirandi Riwoe is a short, grim story about an Indonesian girl, Mina, whose life changes when her father sends her to work for a Dutch merchant. The move from her sheltered, gentle life in a small fishing village to servitude in the merchant’s large house, exposes Mina to new feelings and new experiences, not all of which are welcome. She smells the night air, searching for the salt of the sea on the evening breeze… It’s in these closing moments of each night, when she feels the ocean’s presence, Mina remembers who she is. But the memory has weight, sinks in her chest like a pebble in the sea. She misses her mother. She misses the silence of plaiting the netting with her, she misses their rhythm of scaling the fish. From the outset, most readers will predict the tragedy that will befall Mina – her story is sadly familiar in colonial history. Riwoe delivers it with care, fine detail and a brutal ending that left me feeling horrified but not surprised. Will it win the Stella Prize? I don’t think so – the fleeting experience of reading a novella isn’t quite enough against some of the other shortisted titles. This novella was a pleasure to read. It is inspired by Somerset Maugham's story 'The Four Dutchmen'; and focuses on a young Indonesian girl called Mina, who is taken from her village one day to go work for a Dutch merchant. The decision was made by her father because he wanted benefits of produce such as spices & tobacco that would come from his daughter's employment. Mina is heart broken and feels that the arrangement is punishment; she loves her simple life in the village, making nets and cleaning fish with her mother. Her mother reassures her my using her affectionate name,"Tak-Tak' or 'Starfish' that she hasn't done anything wrong and so Mina leaves her village and begins work at the Dutch merchants. Riwoe tells her story in three acts, each preceded by epigraphs from Maugham’s story. In the first part, Mina is offered by her father to a man who comes searching for “cheap labour for the Dutch Resident’s kitchen.” The barely pubescent Mina doesn’t want to go, has never left home before, but for her parents, her father in particular, there is hope that she will be able to send them things they “need, like more spice and tobacco.” Mina is scared, but we also get an intimation of resilience when we’re told of the “tremor of excitement finally mingling with the dread in her stomach.” Maybe it will work out alright we hope. In a week where I’ve spent a significant amount of time thinking about colonialism, and the stories we tell about it, this was a timely read. Riwoe’s novella is a real achievement. Her prose is direct, and highly evocative of place. She captures the internal life of the Fish Girl- her hopes, dreams, fears, and concerns so concisely, but with such care. Although I haven’t read Maugham’s work- on which this is based, I imagine it would make an excellent companion read- much like Jane Eyre, to Wide In a week where I’ve spent a significant amount of time thinking about colonialism, and the stories we tell about it, this was a timely read. Riwoe’s novella is a real achievement. Her prose is direct, and highly evocative of place. She captures the internal life of the Fish Girl- her hopes, dreams, fears, and concerns so concisely, but with such care. Although I haven’t read Maugham’s work- on which this is based, I imagine it would make an excellent companion read- much like Jane Eyre, to Wide Sargasso Sea. Either way, this certainly is framed as a story retold- in a very compelling and challenging way. I really enjoyed this story. I find adaptations really interesting - I like the feeling of a story expanding to be seen from different perspectives. I haven't read the original short story that this is based on (The Four Dutchmen by W. Somerset Maugham) but still appreciated that sense of the protagonist (a young Indonesian girl called Mina) getting the chance to tell her story, in her own voice. In the original, she is apparently never even given a name; but in this novella, we're given context I really enjoyed this story. I find adaptations really interesting - I like the feeling of a story expanding to be seen from different perspectives. I haven't read the original short story that this is based on (The Four Dutchmen by W. Somerset Maugham) but still appreciated that sense of the protagonist (a young Indonesian girl called Mina) getting the chance to tell her story, in her own voice. In the original, she is apparently never even given a name; but in this novella, we're given context about who she is and where she's from, and how she's taken advantage of by almost all the men in her life. I felt like I was really pulled into Mina's body - you felt the burning and itching of her eczema, the claustrophobic feeling of her servants uniform, her experiences of tasting new foods, and the smells that reminded her of home. Overall, a really great short read. There's also a great TED talk where the author talks about how she is motivated by "writing back" to colonialist writers to give marginalised people a voice. Clever and literary, with simple, lovely language this was an interesting and worthy exploration of a minor and poorly treated character in Colonialist literature. The experience of Indonesian life under Dutch rule is an extremely interesting (and deeply tragic) one and I liked the insight into life in a Javanese village, the things that Mina has never had. There are some clever touches, Mina's mother's beloved Batik being used to store vegetables for example, and Mina's interactions with the Ja Clever and literary, with simple, lovely language this was an interesting and worthy exploration of a minor and poorly treated character in Colonialist literature. The experience of Indonesian life under Dutch rule is an extremely interesting (and deeply tragic) one and I liked the insight into life in a Javanese village, the things that Mina has never had. There are some clever touches, Mina's mother's beloved Batik being used to store vegetables for example, and Mina's interactions with the Javanese Queen of the Sea goddess I liked a lot, and would have been interested to see extended. Overall though, I found this just horribly depressing -- and considering the content that makes perfect sense. that's not to say the content was tawdry, or undeserved, but rather it is not a reading experience for everyone -- I have seen this catalogued as YA in some places and it is assuredly not! The more I think about it the more I deeply dislike this book. The writing is fine but something about it just feels cheap and dirty. I admired this brief and furious novella, historical in setting but contemporary in ideas. Mina is a Javanese girl in a fishing village, until she is sold to a Dutch master in the town of Wijnkoopsbai. There, her idyllic former life is slowly eroded by the most banal of human horrors. The Fish Girl is an act of literary justice for the criminally underwritten ‘Malay trollop’ in Somerset Maugham’s short story of ‘comic and celebrated friendship’, The Four Dutchmen. While her treatment in Riwoe’s I admired this brief and furious novella, historical in setting but contemporary in ideas. Mina is a Javanese girl in a fishing village, until she is sold to a Dutch master in the town of Wijnkoopsbai. There, her idyllic former life is slowly eroded by the most banal of human horrors. The Fish Girl is an act of literary justice for the criminally underwritten ‘Malay trollop’ in Somerset Maugham’s short story of ‘comic and celebrated friendship’, The Four Dutchmen. While her treatment in Riwoe’s novel is just as brutal, she is at least given a home, a family, her own hopes and dreams. Everything about this novella is to the point. Nothing is wasted; the writing is as truncated as Mina’s life. It is divided into three parts, each framed by quotes from Maugham’s story. While these are plenty to sketch in the essentials of what I think Riwoe is doing, reading he full thing (which you can here) shows just how short shrift the Indonesian character is given. I loved the unity of writing and concept, from the sentence to the form. The Fish Girl is a beautiful, compelling and powerful novella. The concept is great, Riwoe has taken a literary character mentioned in passing who merely played their role and then was forgotten and given this character, the "Malay Trollope" a story, a personality, a life. This short story was the perfect length giving the reader powerful insight into the difficult life of our character. I fell headlong into the story and found myself caught up in our character's uncertain life. The ending is ab The Fish Girl is a beautiful, compelling and powerful novella. The concept is great, Riwoe has taken a literary character mentioned in passing who merely played their role and then was forgotten and given this character, the "Malay Trollope" a story, a personality, a life. A deceptively simple loss of innocence tale set during the colonisation of the East Indies by the Dutch. The writing style is clever as it lulls the reader into a false sense of security before delivering a powerful wallop at the end. I had very mixed feelings after reading this short story that kept me thinking for hours. While set in historical times, the main thrust of the narrative resonates well into contemporary times. But it is very confronting and won't be to everyone's taste.